If you asked a stranger on the street how they felt about child labour, it’s safe to say most people would not offer support for it. Yet evidence about the widespread damaging effects of child labour is overwhelming and we need to do more than hold a moral card against it, especially when we often support the demand for child labour unknowingly through our purchases. There are 168 million child labourers around the world today. Around half are estimated to be in a hazardous form of labour. Over 10% of the world’s children over 5 years old are child labourers. That means that one child in every ten is currently working under conditions detrimental to their physical and mental health. This is the same percentage of people who travel to work via public transport in Australia. More than 2 out of 5 child labourers are aged between 5 and 11 years old. That means nearly half of child labourers are younger than Australian high school age. This is more than the percentage of people in Australia who own one car. More than 1 in 5 children in Sub-Saharan Africa are engaged in some form of child labour. That means in a group of five friends, one is unable to attend school due to being forced into child labour. This is around the same percentage of people in Melbourne who live in a two-bedroom household. These are just some of the facts surrounding the pervasiveness of child labour. Child labour is declining due to collective efforts but it is clear there is a long way to go. While these statistics are alarming, behind each statistic lies a personal story – both heartbreaking and mostly preventable. A good start to preventing demand for child labour is to know the standards of the product that you buy. Try downloading the shopethical! app for your next trip to the supermarket or asking your local café about their coffee and tea suppliers. Information about the Author: Rachel Hoy is a VGen Youth Campaigner for World Vision Australia who works on the #FreeTo campaign. She just completed a Master of development studies at the University of Sydney. 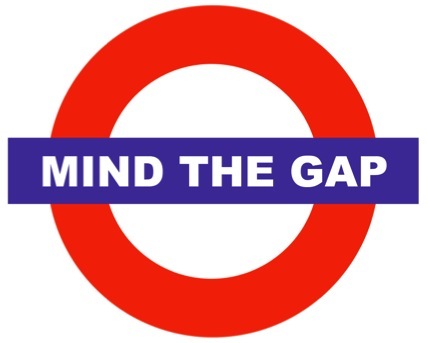 Have you ever wondered how large the gap in living standards is between countries? Or how this has changed over time? For example, to explore how the Wealth and Health of Nations has changed over time click on the picture below to open Gapminder’s interactive display. 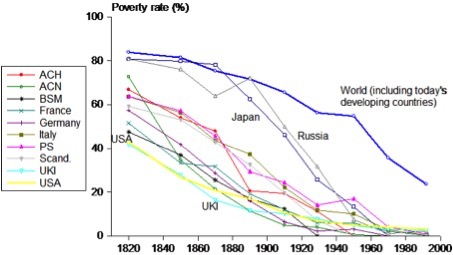 Gapminder also has a series of brief and informative YouTube clips, such as the following video that shows how 200 countries have developed over the last 200 years in just 4 minutes. 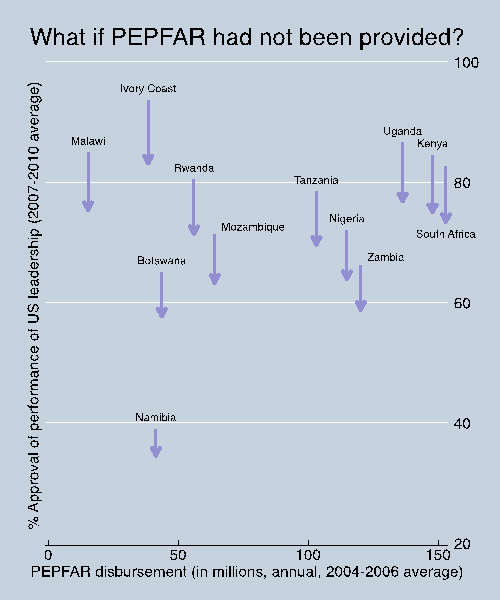 Are Developing Countries too dependent on Aid? 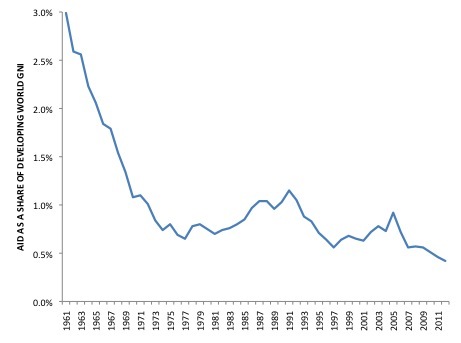 Aid as a share of Gross National Income (GNI) in developing countries has remained below 1% for the last 20 years. In 2012, it reached the lowest level ever recorded. Least Developed Countries receive more than ten times as much aid as a share of GNI as Middle Income Countries. The Pacific receives the highest level of aid as a share of GNI for any region in the world. A great deal of attention is given to the level of aid as a share of GNI that developed countries provide, however less attention is given to aid as a share of GNI that developing countries receive. This measure is important to examine because it provides insight into how dependent developing countries are on aid. While there is a considerable variation between countries, the chart below shows that on average aid to developing countries has remained below 1% of GNI for the last 20 years. 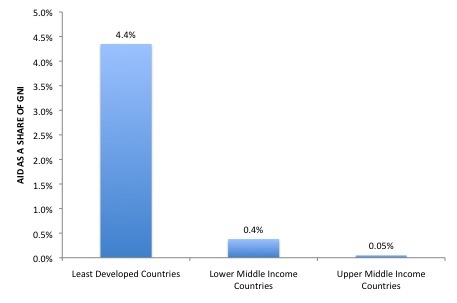 Least Developed Countries (LDCs) receive significantly more aid as a share of GNI than Middle Income Countries. 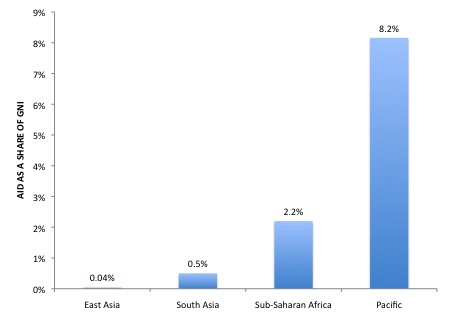 However on average aid as a share of GNI is still below 5% in LDCs. 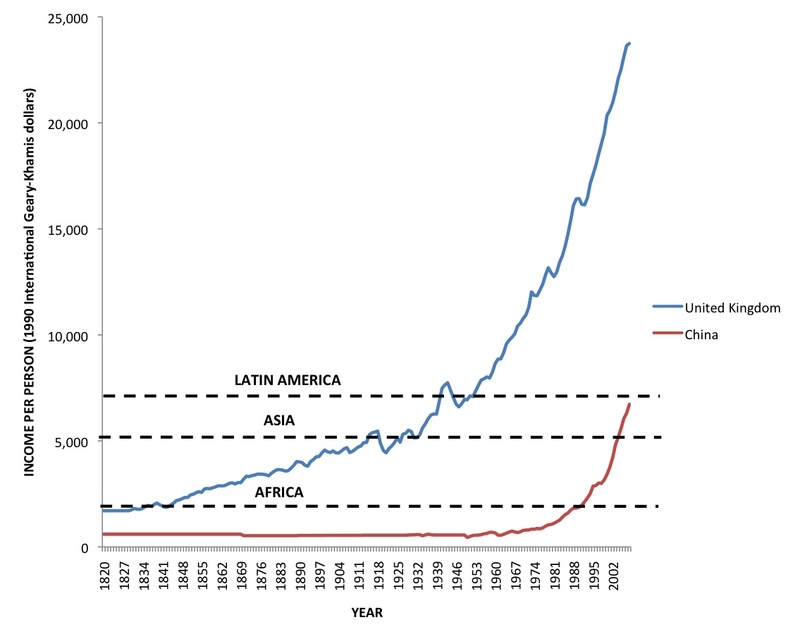 As the chart below shows as countries’ incomes increase they tend to become considerably less dependent on aid. There is tremendous variation in the level of aid as a share of GNI across regions. 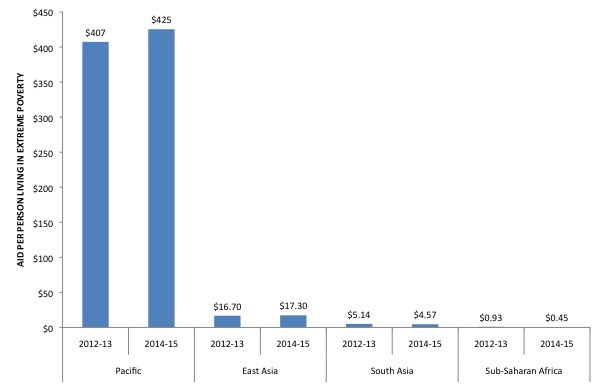 The chart below shows that the Pacific region receives almost 10% of GNI in aid. The low level of aid as a share of GNI for East Asia is partly due to high economic growth in the region in recent decades that has reduced dependence on aid. 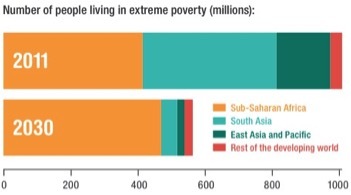 On average, there is little reason to believe that developing countries are too dependent on aid. However for some countries this concern may be more valid. For example, the Solomon Islands have received around 40% of GNI in aid for the last decade. 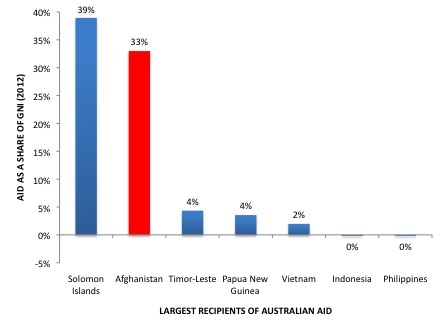 On Tuesday, the Australian Government not only cut the aid budget, but it also further redirected aid away from the majority of the world’s poor. 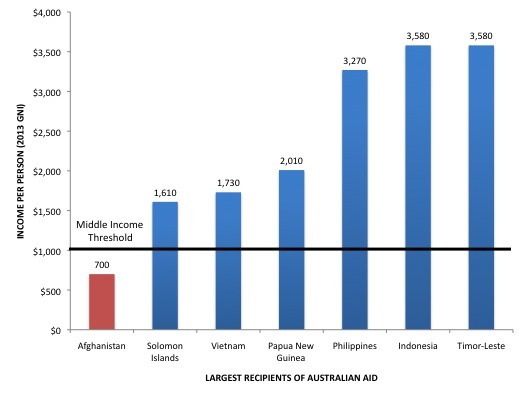 Australia spends less than $1 in aid per person in the developing world each year. 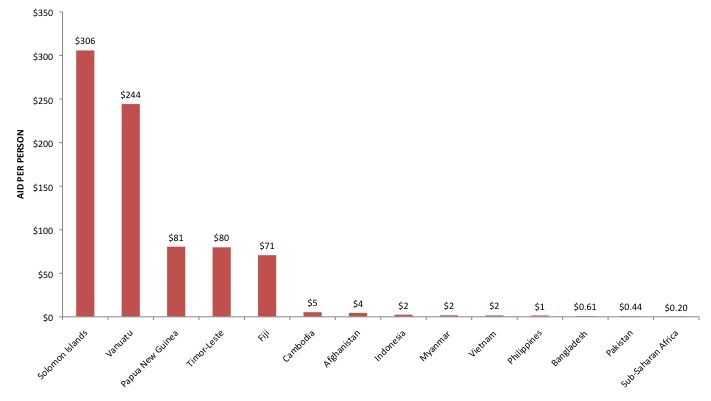 This makes it incredibly important where the aid is spent. Australia’s largest aid partners in the Pacific receive up to almost a $1 per person every day. This is more than 1,500 times the amount of aid Australia provides per person to Sub-Saharan Africa. While reducing the overall aid budget, the Government increased aid to the Pacific and more than halved aid to Sub-Saharan Africa. 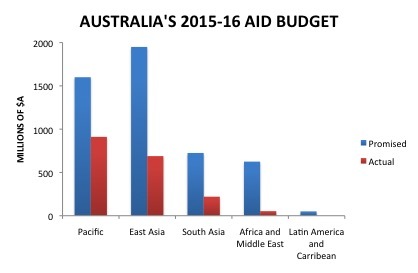 On Tuesday, the Australian Government cut the aid budget for the sixth time in two years and it further redirected aid away from the majority of the world’s poor. 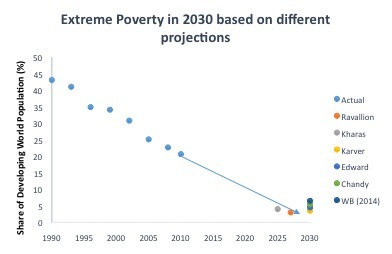 As outlined in this post here, the Australian aid program does not focus on the majority of the world’s poor, and disappointingly, the new Government is exasperating this. The magnitude of the bias towards Australia’s neighbourhood is shown in the chart below. While cutting overall aid spending, the new Government increased aid to the Pacific and East Asia, by reducing aid from South Asia and Sub-Saharan Africa. The chart below shows how regional aid allocations have changed under the new Government in terms of aid per person living in extreme poverty. In the pursuit of budget savings, the new Government has not only, targeted the aid budget, but also disproportionately targeted people living in poverty outside of Australia’s neighbourhood. Given that the cuts to the aid budget make up over 20% of the total cuts to the budget, the Australian Government is trying to balance the books on the backs of the poor, in the poorest regions in the world. Further evidence that using aid to reduce poverty is in the national interest of donors has recently been published in the Quarterly Journal of Political Science. Rigorous analysis by University of Sydney, Dartmouth College and Australian National University academics, shows that aid targeted towards poverty reduction can improve the public perception of donors in recipient countries. They illustrate that one of the United States Government’s flagship aid initiatives, the President’s Emergency Plan for AIDS Relief (PEPFAR), significantly raised public perception of the United States in aid recipient countries. For example, it is estimated that if PEPFAR had not been provided to Kenya, approval of United States leadership would have fallen from around 85% to 75%. The chart below shows the results for a number of African countries.